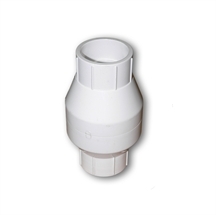 1-1/2" PVC Spring Check valves are used to prevent back-flow and siphoning. The 2 lb. SS spring maintains a positive seal even when no back pressure is present. A 2 psi minimum flow pressure is required to open valve. They have a pressure rating of 100 psi non-shock water at 73°F. Flow direction indicator molded into body. 304 SS spring is corrosion resistant. Thermoplastic spring check valves shall be constructed from PVC Type 1, cell class 12454 material conforming to ASTM D-1784. Seals shall be EPDM. Socket end connections. 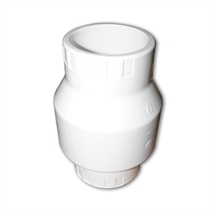 2" PVC Spring Check valves are used to prevent back-flow and siphoning. The 2 lb. SS spring maintains a positive seal even when no back pressure is present. A 2 psi minimum flow pressure is required to open valve. They have a pressure rating of 100 psi non-shock water at 73°F. Flow direction indicator molded into body. 304 SS spring is corrosion resistant. Thermoplastic spring check valves shall be constructed from PVC Type 1, cell class 12454 material conforming to ASTM D-1784. Seals shall be EPDM. Socket end connections. 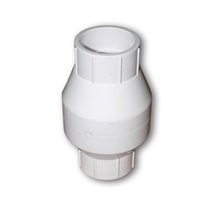 3" PVC Spring Check valves are used to prevent back-flow and siphoning. The 2 lb. SS spring maintains a positive seal even when no back pressure is present. 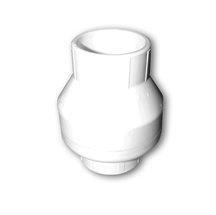 A 2 psi minimum flow pressure is required to open valve. They have a pressure rating of 100 psi non-shock water at 73°F. Flow direction indicator molded into body. 304 SS spring is corrosion resistant. Thermoplastic spring check valves shall be constructed from PVC Type 1, cell class 12454 material conforming to ASTM D-1784. Seals shall be EPDM. Socket end connections. Ship weight 1.5 lbs. 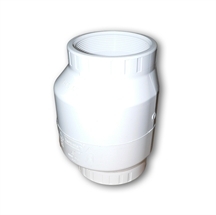 4" PVC Spring Check valves are used to prevent back-flow and siphoning. The 2 lb. SS spring maintains a positive seal even when no back pressure is present. 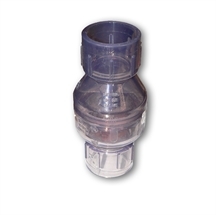 A 2 psi minimum flow pressure is required to open valve. They have a pressure rating of 100 psi non-shock water at 73°F. Flow direction indicator molded into body. 304 SS spring is corrosion resistant. Thermoplastic spring check valves shall be constructed from PVC Type 1, cell class 12454 material conforming to ASTM D-1784. Seals shall be EPDM. Socket end connections. Ship weight 1.5 lbs. 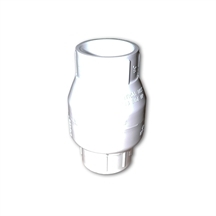 PVC Clear Swing Check Valve 1 1/2" SxS # 1520C-20, Clear PVC body, EPDM seat and "O" rings; No metal parts; Pressure rated: 125 PSI @ 72° Fahrenheit; Full flow design for both horizontal and vertical usage; Connection: 1 1/2" solvent weld; Length: 6".